Herods Dead Sea Hotel combines luxury, spa, gastronomy and excellent service in the lowest place on earth. 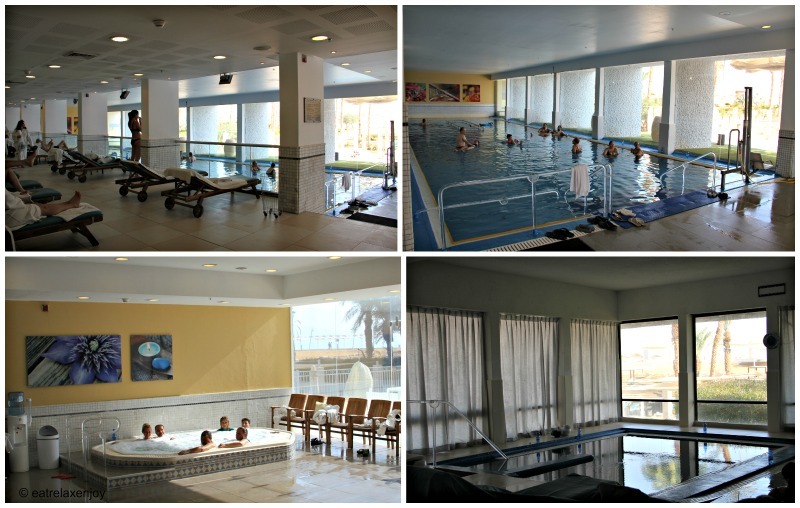 The hotel enjoys beautiful setting on the bank of the Dead Sea, indoors Dead Sea salt pool and Sulfur pools and lots of opportunities for sports and relaxation. With only 50mm of rain a year and 330 days of sun – the Dead Sea is where you want to be, especially in the winter! While it gets very hot and dry in the summer, during the winter, the temperatures are normally around 20-30c (70-80f) and hardly ever drop below 10c (50f). I took this photograph from the room’s balcony at twilight, the air was dry and still mid December! Herods is nicely designed with a touch of luxury, inspired by the Dead Sea colors of blue and grey, with a touch of pink and purple. 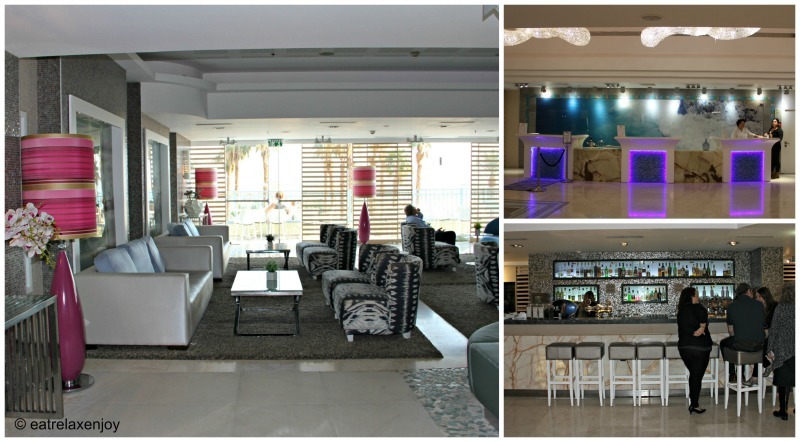 Here’s a peek at the reception area, the lobby and the bar. In addition to the lobby, the hotel has a quiet Library area with books, newspapers, and even computers. The lounge serves the executive rooms for light meals, a drink, and a place to socialize during the day. The rooms at Herods Dead Sea are refurbished and designed to give the sea atmosphere with turquoise color. 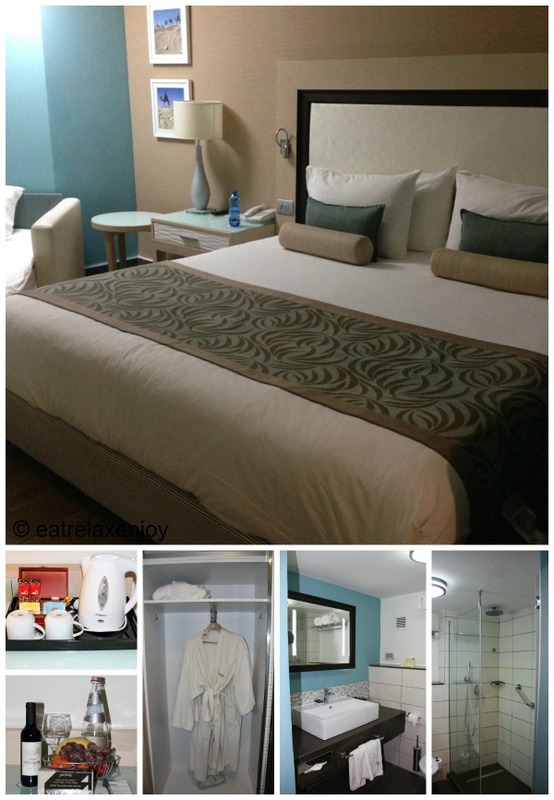 The rooms are modern and each has climate control unit, a shower and a balcony overlooking the beach and the pool. Each room has a flat-screen tv, coffee making facilities, and a mini bar. The room are quite spacious and can accommodate a sofa that turns into a full-size bed for a third adult or the younger visitors. 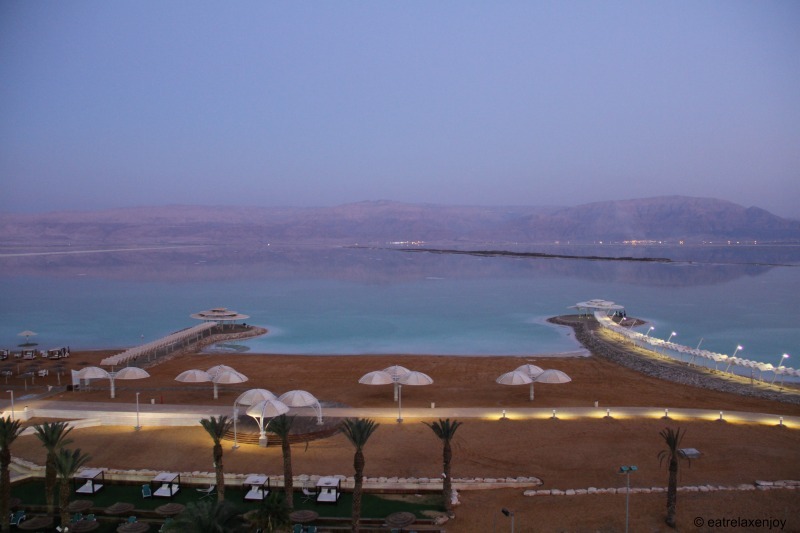 The main reason people come to the hotel is the Dead Sea. 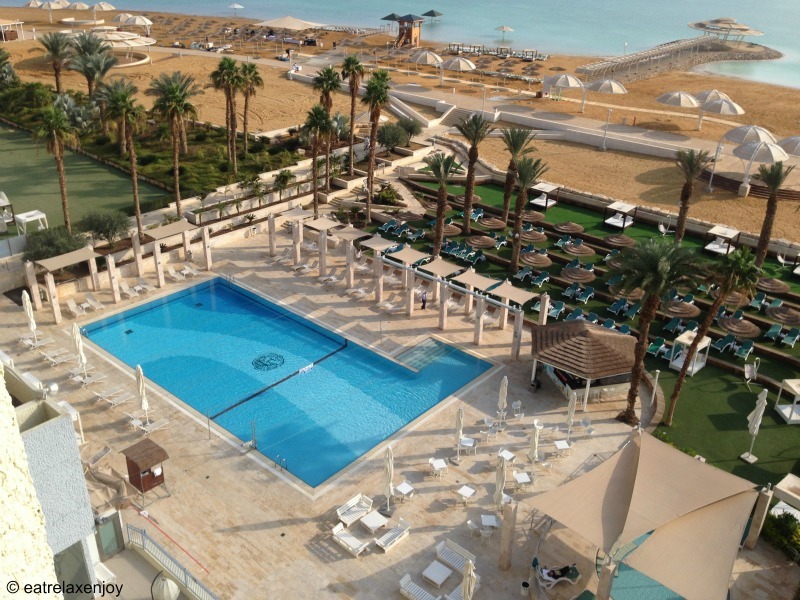 Herod’s beach is well-groomed with cabenas, showers, and even an eye washing fountain! With the beautiful weather here, the outdoor heated pool is open year-round! 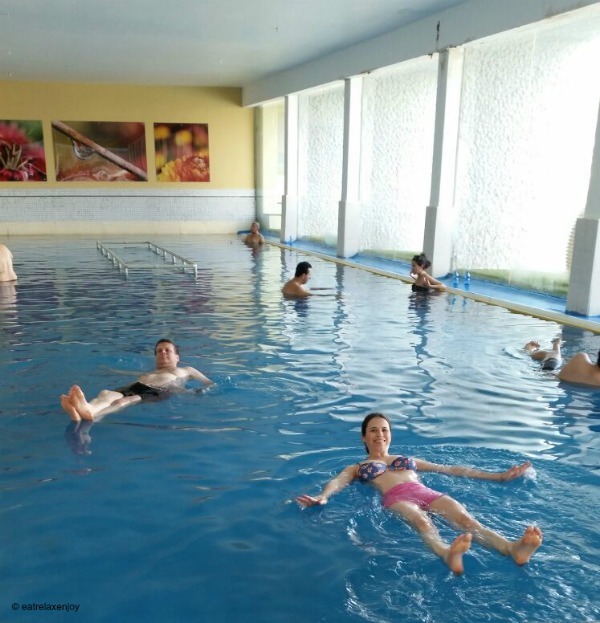 If you are a bit spoiled like we Israelis (who can’t handle it even when the temperatures drop just a little bit), you might take advantage of the indoors sea water pool. The hotel also has a hot tub, Sulfur pools and a Turkish Hamam and a full spa servicing all massages and treatments. The water in the dead sea, as well as in the indoors salt pool are heavy because of the salt and the biggest sports here is floating, which is cool! if you prefer real sports, try the gym or take on of the many classes offered at the hotel from Hydro pilates in the salt pool to FitBall and Aerobic Zumba. No holiday can get away without some decent food, and the food at Herods Dead Sea, similarly to the Herods Herzeliya, is excellent. The food presentation is impressive and the selection is endless. 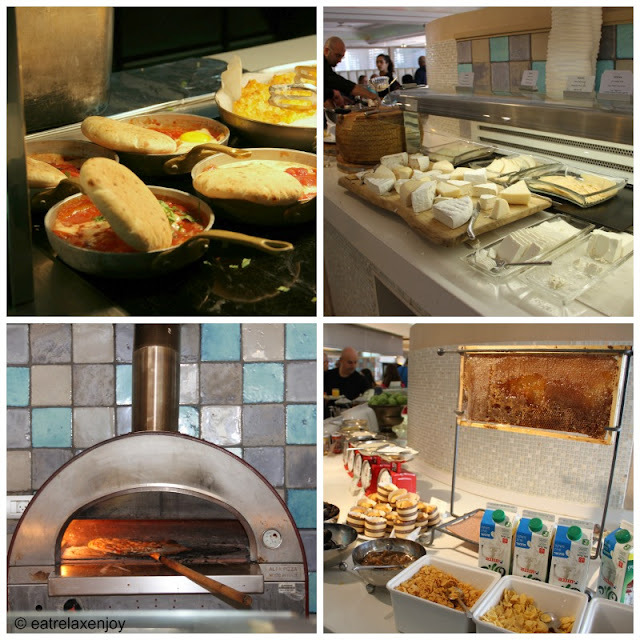 Here are a few examples, at breakfast they serve a nice selection of cheeses, bowls of sliced vegetable for you to essemble exactly the salad you want, omlets are made to order, burekas, ravioli, shakshouka plates (see top left in the photograph below) , antipasti, fish, pies, cheesecakes, jelly, assorted sweets and boutique breads. Even pizzas are made fresh in a special oven in front of the diners! The hotel also serves diet food and gluten free food. We also had dinner at the hotel. 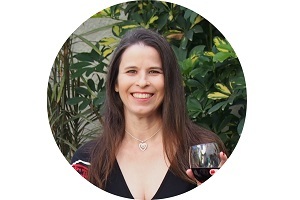 At Shabbat dinner, the tables were dressed in white, each with a Kidush glass and a small bottle of Kidush wine. 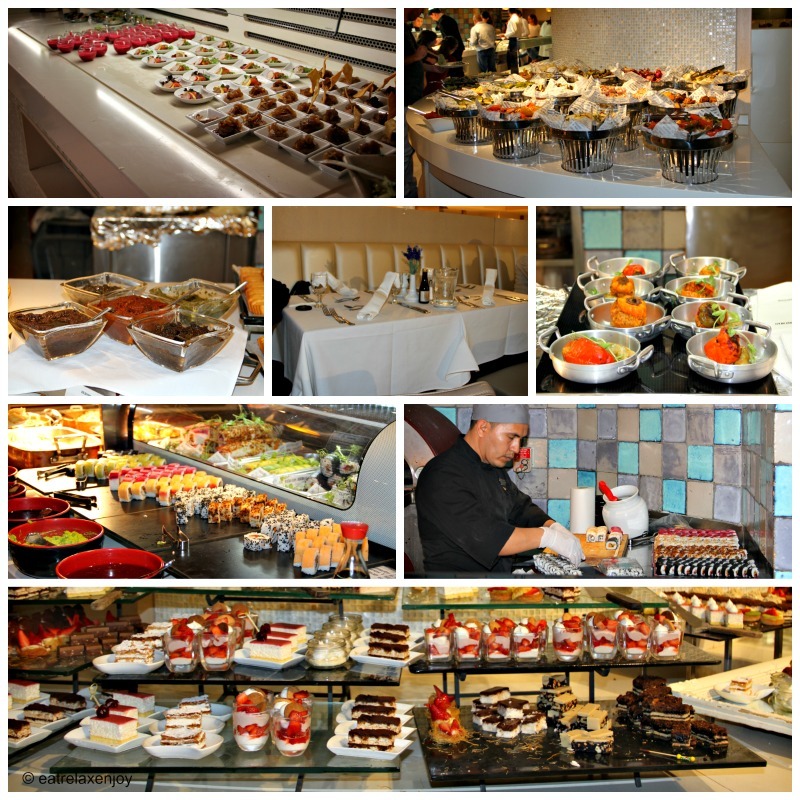 All the meals, including dinner, is served buffet-style. The ‘problem’ here is how not to overeat. The quantity, variety and looks of the food was beyond imagination. Veyond tapand, chicken liver pate, antipasti, sushi, and many more apetizers, there was an endless selection of main courses: Asado, stuffed chicken, duck, Kube, couscous, ravioli, veegetables, potatoes, rice, stir fried chicken and beef, steaks, and a long buffet of desserts. The hotel offers many options for outdoors activities such as bike rides, local hikes, kiddie club, etc. If you are interested in hiking, you might be interested to hike to Masada and I also recommed the Masada Sound and Light Show. This website has more travel related information about Israel.